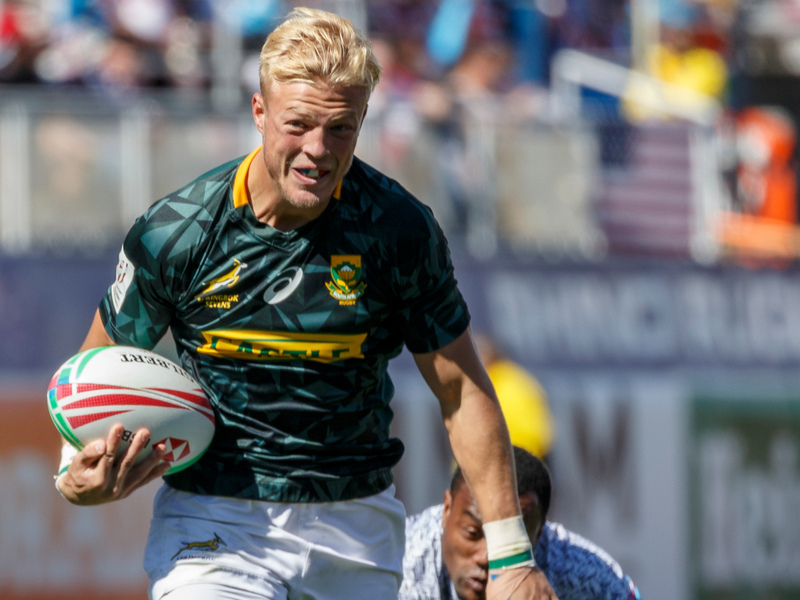 South Africa denied Fiji back-to-back titles in Singapore with a dramatic 20-19 victory in the World Sevens Series Cup final at the National Stadium. The Blitzboks, who have only won two of their 30 Cup titles in Asia, scored 20 unanswered points to complete the most remarkable of comebacks. It was a turnaround that won the UL Mark of Excellence Award. The final, from start to finish, was an exceptional contest and one of the most gripping in this world series. Fiji flew into the lead in the opening seven minutes, looking unstoppable as Aminiasi Tuimaba, Napolioni Bolaca and Vilimoni Botitu made their intensity count on the scoreboard. Youngster Kurt-Lee Arendse commenced their fightback before Player of the Final Angelo Davids and Ryan Oosthuizen followed. In the final seconds, South Africa remained two points down before Selvyn Davids scored a late penalty and they held Fiji out to complete the job. Meanwhile, England equalled their best finish since Sydney by securing the bronze medal with a 28-7 victory over the USA. The match was a passionate affair and both sides saw yellow cards in the first half, including two for Joe Schroeder (deliberate knock-on and a dangerous tackle). The USA held firm and forced England to go well beyond normal time in order to gain an advantage. Simon Amor’s side went into the break 14-7 up and worked their numerical advantage for the whole of the second seven minutes to create their 21-point win and secure 17 crucial world series points. An improving Samoa ensured that they finished in fifth position with a 19-17 victory over New Zealand while France secured the Challenge Trophy – awarded to the team finishing ninth – in the most dramatic of fashions with a hard fought 22-19 victory over Scotland. The results mean that South Africa remain in fourth place in the world series standings with 121 points but open up a 14-point cushion over fifth-placed England with 107 points. Fiji, now on 142 points, cut the USA’s lead at the top of the standings to just three points with New Zealand sitting in third on 130 points. The top four at the end of the 2019 series will qualify directly for Tokyo 2020. With the complexion of the world series standings going into the tournament, the USA, Fiji and New Zealand all had the potential to secure qualification for Tokyo 2020. However, with the twists and turns of the two days, none were able to achieve the world series points required to do so and the race for early Olympic Games qualification continues.